Looking for German Shepherd puppies? We have loads of info all about adorable GSD pups and dogs. First of all, let me remind you that baby German Shepherds grow into full sized German Shepherd Dogs. Don't forget that. Now I know that sounds fairly logical but I am constantly surprised by people who turn their GSDs in to shelters and the like because "they didn't realize how big the German Shepherd puppy would get". Or they didn't realize how much the GSD puppy would shed, how much they would eat, etc., etc. Please don't be one of those people. 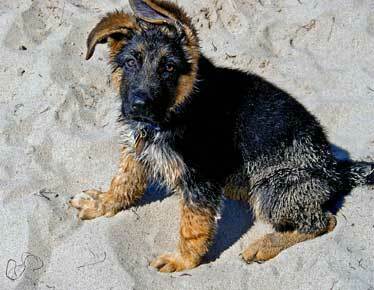 If you already have a German Shepherd Dog or puppy, let us teach you even more about the breed. And if you are thinking about getting one, but haven't yet, we can also help you learn more about this wonderful dog breed. And I'll be the first to admit that these ARE great dogs - but they are NOT for everyone. 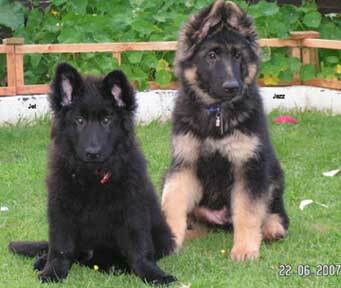 Maybe you are even looking for information about free german shepherd puppies? Or maybe you already have one and are looking for information about shots and worming. Perhaps you remember stories about an alsatian dog that your parents or a friend or maybe even a co-worker told you about and you want to learn more about the breed. Then you're in the right place. Just exactly what do you want to know about these little fur balls? Do you need to read up on German Shepherd Facts? Looking for tips about training a german shepherd puppy? What about some great, and to-the-point German Shepherd FAQ tips? Yes, we do have all that and more. And I'll be the first to admit that these are some of the most beautiful puppies on the planet making them hard to resist. But if you are not aware of exactly what that GSD puppy is going to need during it's lifetime, what makes a German Shepherd a German Shepherd in the first place, and what to expect health-wise, training-wise and socialization-wise, then I can tell you right from the start, chances are high that you will probably be a mismatched pair. Why? Exactly because of all those things that make a German Shepherd a German Shepherd! A German Shepherd Dog is an athletic dog. An incredibly intelligent dog! A very devoted dog breed. A dog that needs a job to do. They are a very versatile dog breed - capable of doing all most anything (that's why you see them in so many varied jobs - from tracking, bomb sniffing, herding, guarding, search and rescue to personal companion of the blind, sick and handicapped). German Shepherd pups can be wonderful companions for kids and adults alike. And in the right homes, they mature into fantastic guardians friends. They also come in a wide range of coat colors. Handsome, intelligent and majestic animals that want nothing more than to please you, a well adjusted, well trained and well socialized German Shepherd Dog can make a fine pet. And German Shepherd pups are little sponges just waiting for you to fill them up with the right training, socialization, food and love. And if you have taken the time to learn about these little guys BEFORE you get one, I can assure you that you'll have a much better experience - because these dogs are NOT for everyone. But that is another reason that I think they are so special. If everyone had one they wouldn't be nearly as unique - don't you agree?